If you are interested in our In-Home Piano or Guitar lessons for the County of San Diego, San Diego, La Mesa, El Cajon, Hillcrest, La Jolla, Kearny Mesa, Mira Mesa, we would like to hear from you. Please use this Contact Us form. We will get back to you within one business day. 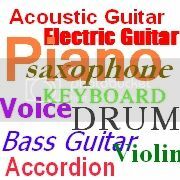 We also offer Online Music Lessons: Piano/Keyboard, Guitar, Drum, Bass Guitar, Voice, Violin, Saxophone, and Accordion. If you would like to get more information regarding any of this classes, please let us know as well. Privacy Notice: We respect you privacy. You contact information will be used solely to respond to your comments or questions regarding our In-Home Music Programs or our Enrichment Programs, and we will never share you information with anybody else. – In-home Piano/Keyboard Lessons >> $30 for 30min. – In-home Guitar Lessons: Electric or Acoustic >> $30 for 30min. – Piano/Keyboard Lessons >> Complete Course is $39-$49 only. Money Back Guarantee. – Online Guitar Lessons >> Complete Course is $49.97 only. Money Back Guarantee. You can try it for Free before you buy it! – Online Drum Lessons >> Complete Course is $49.95 only. Money Back Guarantee. – Online Bass Guitar Lessons >> Complete Course is $29.95 only. Money Back Guarantee. – Online Voice Lessons >> Complete Course is $99.95 only. Money Back Guarantee. – Online Violin Lessons >> Complete Course is $27.00 only. Money Back Guarantee. – Online Saxophone Lessons >> Complete Course is $19.00 only. Money Back Guarantee. – Online Accordion Lessons >> Complete Course is $35-$45 only.